Get your adrenaline pumping double time with this private tour from San Jose combining two of Costa Rica's most popular outdoor adventures. Drive through gorgeous Braulio Carrillo National Park to a tropical secondary forest, where you’ll fly through the treetops on a thrilling 9-cable zipline tour. 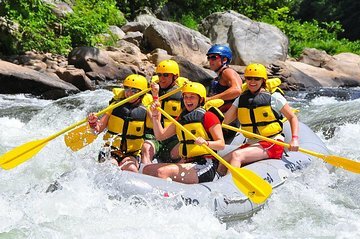 Then, tackle the class II and III rapids of the Sarapiqui River on a wet and wild whitewater rafting voyage led by an expert guide. Includes round-trip transport from your San Jose hotel in the comfort of a private vehicle. Prepare for morning pickup at your San Jose hotel, and travel in a private vehicle from the clamor of the city to the unspoiled beauty of the Sarapiqui territory, a northeastern swath of the country characterized by traditional villages, crystalline rivers, and pristine tropical forests. Along the way, pass through scenic Braulio Carrillo National Park. When you arrive at base camp, gear up and channel your inner Tarzan on an exhilarating canopy tour. Fly through the lush treetops of a secondary forest using a series of elevated platforms and nine different cables of varying length. On the final stretch, soar over the churning waters of the Sarapiqui River for a preview of your next adventure. In the afternoon, head to a launch point along the Sarapiqui and climb aboard a raft for a 9-mile (14.5-km) journey down the scenic waterway. With the help of your expert river guide, battle class II and III whitewater rapids, taking a breather along calmer stretches to soak up the amazing scenery and keep an eye out for wildlife along the riverbanks. After successfully conquering the river, relax on the private return drive to San Jose, where the full-day tour concludes back at your hotel.